Over 200 participants took part in this three day event, held from November 9-11 2016 in Apeldoorn, the Netherlands. The event was related to the celebration of 100 years land consolidation in the Netherlands. 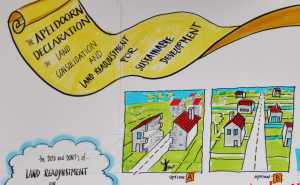 Co-organisers were the Food and Agricultural Organisation of the UN, Landnet and the International Federation of Surveyors and Kadaster, Netherlands – with support from UN Habitat, the Global Land Tool Network and the World Bank. Focus was on urban and rural environment and to applications for sustainable development. The participants came from fifty countries from all over the world. Land consolidation and land readjustment is basically about improving the structure of people to land relationships for one or more purposes. This is usually associated with broad economic and social reforms. As an implementation tool for spatial planning this can be combined with the development of infrastructure, public services and water management. The principles of both tools are basically the same: pooling of all the land parcels in a particular area and planning them as a unit and then dividing up the land again to the original land owner or user. A proportion of the land can be used for public purposes such as infrastructure, nature and public space. Experts presented their research and project results during the parallel sessions of the symposium. The global perspective contributed to a collection of examples of how land consolidation and readjustment can contribute to the Sustainable Development Goals of the UN. The symposium was concluded with the ‘Apeldoorn declaration on land consolidation and land readjustment for sustainable development’. Here it is said that there are some common principles in the use of the tools – but no one-size-fits-all-solutions of land consolidation and land readjustment exist. A comprehensive approach in land consolidation and land readjustment favours a sustainable development in the way that it benefits the people, planet and economic profit. The spatial component of these instruments is a very powerful asset of land consolidation and land readjustment to manage land use. The spatial rearrangement of land rights can help mitigate the negative effects of for example climate change, such as extreme rainfall or drought, rising sea levels, global warming, salination, and the decline of suitable habitat for species (biodiversity). However, it becomes even more powerful when it is combined with additional policies and measures to address the causes of unsustainable development. Surveyors and agronomists should closely cooperate with ecologists in order to design reallocation plans with “green fingers”. The FAO Voluntary Guidelines, the UN 2030 Agenda for Sustainable Development and the New Urban Agenda from UN Habitat should guide the application of Land Consolidation and Land Readjustment. In all cases it is relevant to recognise a plurality of tenure types that are relevant in negotiations around and planning for land consolidation and land readjustment. The treasures within this area of expertise to design resilient landscapes is enormous. Awareness raising on the benefits that the tools can bring is needed – especially for politicians and policy makers.